Dr.G.N.Qureshi´s Laser Eye Institute offers a full line of refractive treatments including FEMTOSECOND lasik laser. Unlike other laser centers that solely focus on LASIK Doctor.G.N.Qureshi offers an array of different treatment options. This gives him the ability to recommend the best method of treatment based on a full understanding of vision correction, not just one procedure (LASIK). During your consultation you will meet with Doctor.G.N.Qureshi, he will personally examine your eyes and recommend the best method of treatment. We recommend learning about common refractive errors (vision problems) before exploring the methods of treatment. Please Read Below. A refractive error is an error when focusing light, this is the most common reason of reduced visual acuity (poor or blurry vision). 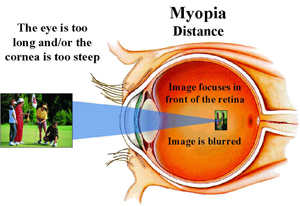 There are many type of refractive errors, however the three most common are myopia, hyperopia and astigmatism. 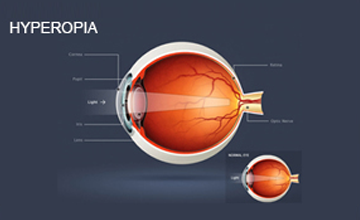 Myopia or nearsightedness, occurs when the cornea is too curved or the eye is too long. This causes light to focus in front of the retina, resulting in blurry distance vision. Hyperopia, or farsightedness, occurs when the cornea is too flat in relation to the length of the eye. This causes light to focus at a point beyond the retina, resulting in blurry close vision. 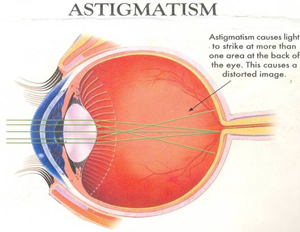 Astigmatism occurs when the cornea is more curved in one direction than the other. This causes light to focus on more than one point on the retina, resulting in blurry and distorted vision.